A 1 percent drop in the regional unemployment rate certainly paints a pretty picture, but, as is often the case, there is much more going on beneath the surface. 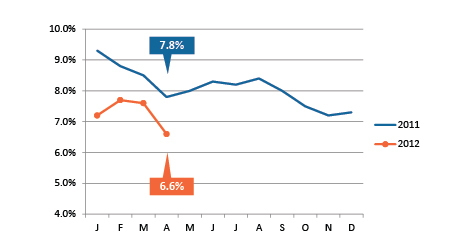 Our unemployment rate dipped to 6.6 percent (down from 7.6 percent in March). This is the lowest point since December 2008. However, looking at another data series, (the Current Employment Survey) we can see that seasonally adjusted employment actually remains stagnant at 990,000. The bigger concern comes from national data for May released just a few days after our local data for April. The national employment numbers for May were disappointing. Economists had predicted a modest increase of about 150,000 jobs nationally, but instead only about 69,000 jobs were added in May — not enough to keep up with population growth. This is a strong indicator that all is not well with the economy. While the economy continues to grow, as measured by Gross Domestic Product, we have not seen matching employment growth. There seems to be persistent reluctance on the part of industry to buy into the current economic expansion. Continued concerns about Europe’s economic health, along with election year politics here at hom,e seem to have put employers in a holding pattern. We’ll expect to see the local impact of these disappointing national numbers in next month’s data. In the meantime, enjoy the look of that 6.6 percent unemployment rate. MARC developed the Regional Workforce Intelligence Network to encourage greater collaboration among the region's workforce data and information professionals. RWIN is a collaboration of economic development professionals, one-stop centers, workforce centers, community colleges and universities that meets on a monthly basis. For more information, visit www.kcworkforce.com. We are now using Current Employment Survey (CES) data to measure monthly employment. The CES is considered more reliable as it is a survey of business establishments. It is also seasonally adjusted. While regional employment is higher than it was one year ago, the level has remained mostly flat this year. 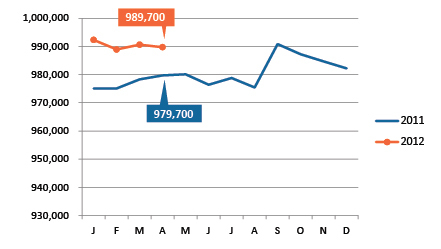 The labor force continues to hover around 1,045,000. We can expect to see a seasonal spike in labor force next month, as recent graduates enter the workforce. [Definition: The number of unemployed as a percent of the total labor force.] A full percentage point decline in Kansas City's unemployment rate is the headline grabber this month. April's 6.6 percent rate is the lowest level since December 2008. 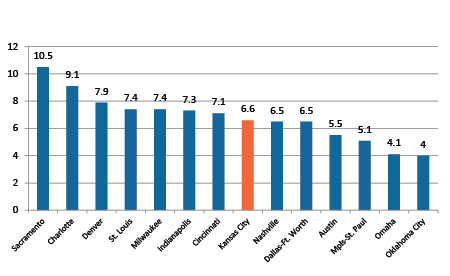 Kansas City was not alone in seeing a large drop in the unemployment rate. All of our peer metros saw their unemployment rates decline between March and April. 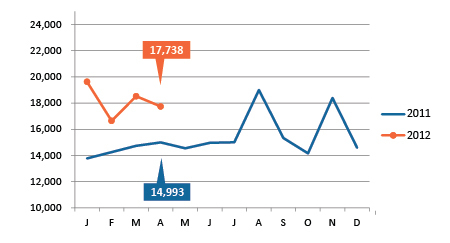 There were 17,738 new job postings in April in the Kansas City area. This is up from 14,993 one year ago. In April 2012, there were 637 new postings for jobs in the manufacturing industries — up from 578 job postings one year ago. The occupations in highest demand for the manufacturing industry are computer, management and engineering occupations. Kansas City manufacturing employment grew by 3,300 between April 2011 and April 2012, an increase of 4.5 percent. None of the peer metros we monitor had such a large increase. Nationally, manufacturing employment grew by just 2 percent. In the Kansas City metro, two big auto manufacturers doubled down instead of cutting back. General Motors added a second shift at Fairfax, and Ford is making a huge investment at its Claycomo plant.